The sense of hearing is one of the most precious but many people don't realize the value until sounds start to get faint and muffled. Total hearing loss can leave an individual feeling isolated from the world and left out from the jokes, music, and everyday sounds that make life. For that reason, the pursuit of regaining full or at least partial hearing is one of the most steadfast treks that a person can endeavor in their life. The treatment possibilities vary in effectiveness and can be costly in some instances. As with any health care procedure or ailment, advances in technology are vastly making a full rehabilitation a distinct possibility. The following methods are striving to ensure that every single human being can enjoy the crystal clear sounds of birds chirping in the morning or just an enjoy a relaxing melody emanating from their stereo. The device is implanted under the skin behind the ears and features a microphone to pick up sounds, a speech processor that filters out external noise, and a transmitter that sends power via electromagnetic induction. 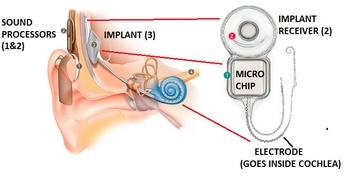 The internal components of the cochlear implants consists of a receiver and stimulator secured into the bone and 22 electrodes woven through cochlea that work to send signals between the nerves and brain. The best candidates to receive cochlear implants are human beings who have competent speech, language, and communication skills. The individual receiving the implant has lived some of their life with hearing but has experienced severe sensorineural hearing loss in both ears. Those with only mild hearing loss should not yet seek a cochlear implant as they can see satisfactory results with other treatment methods (The Hearing Loss Pill or a hearing aid). Also people who have grown up deaf may find the implants ineffective and irritating. Surgery for the cochlear implants can take up to five hours for the procedure to be complete. Patients then stay in the hospital up to a two days and must allow up to a month for the area operated on to heal. The device is then 'turned on' with a sound processor and therapy begins to allow the brain to adjust to hearing new sounds. Costs associated with the cochlear implants can be significant. There are five areas tied in with the bill of the surgery including an evaluation, the surgery, purchasing hardware, hospitalization, and subsequent rehabilitation. All total, patients can expect to spend between $50,000 and $125,000 US dollars, some or all of which may be covered by certain health insurance providers. Stem cells serve as both a useful yet controversial tool to treat many ailments in human beings. The cells have been used in research on everything from reversing the signs of aging to helping to treat Parkinson's disease. Most recently, health care professionals are examining what effects stem cells could have on how to improve hearing loss, or maybe even finding a straight out cure. Specific guidelines change greatly after a doctor's review but there are some basic steps of the cell procedure. Stem cell used in the treatment for hearing loss are most often obtained from umbilical cords or bone marrow. The cells are then induced via an intravenous method, via a spinal puncture, or through some other injection method. The treatment involves a hospital stay of over two weeks and involves the injection of six stem cell packets. It should be noted that this treatment is currently only available in the USA, Canada, and the UK as part of medical research. Patients seeking the stem cell procedure must travel to China, Mexico, the Middle East, or Thailand and typically pay between $18,000 to $30,000 on up in US dollars ? cash only. There are no guarantees and so far the results from the overseas trips are inconclusive. All hope is not lost though as scientists have used human embryonic cells to restore hearing loss in gerbils. There is even a notion that viable treatment could become available sooner rather later as the FDA has announced it' first clinical trial to research the effects of stem cells to restore hearing, culminating in late 2013 2 . Read our complete guide on stem cells for hearing loss. The first hearing aids were surprising developed almost immediately after the telephone. Early models were obstructive and definitely noticeable but the evolution of the design has consistently striven to make them more discreet and convenient to wear. Most of the pieces fit in or behind the wearer's ear and can be worn consistently or intermittently. The units basically collect and amplify sound into the ear and work best with patients with minimal hearing loss. There are many types of hearing aids that have varying shapes, sizes, and power 3 . The BTE design features a case that fits behind the ear that contains all the electrical components of the unit as well as an earmold that fits in the drum. There is a connecting wire that comes down the front of the ear so the device is somewhat noticeable. Sound is routed one of two ways to the ear, either acoustically or electrically. With electrical routing there is a speaker in the ear drum compared to acoustically where a loudspeaker behind the ear transmits sounds to the ear drum. BTE devices are extremely durable and are frequently prescribed for children. Adults who are experiencing slightly above mild hearing loss can also benefit from a behind the ear hearing aid. The BTE hearing aids are available without a prescription and can range from $50 for a basic design up to $1600 for a fully customized fit. A miniature version of the behind the ear hearing aid is becoming immensely popular as its technology advances. The piece follows the same basic concept of the standard BTE aid but much smaller and more discreet. The connecting wire is nearly invisible and the earmold is smaller which leads to a more comfortable feel and the elimination of the plugged up feeling. BTE devices as a whole account for almost 50% of the hearing aid sales in the United States, with the mini BTE cornering a quarter of the market all by itself. Still the mini BTE technology is still developing and with that comes the main downside of the product which is the cost ? routinely over $1000 on the low end up to $2,000 or $3,000 for premium models. Completely in canal hearing aids offer an aesthetic advantage that BTE devices do not. These particular devices are nearly invisible and relatively comfortable because they are custom fit. A small earmold is crafted to an individual's exact inner ear dimensions and fashioned with a microphone and speaker. The device is then placed completely into the ear canal and is almost completely discreet with a faceplate of various skin tones to avoid some of the stigma that can come with wearing a hearing aid. CIC hearing aids are the smallest on the market, which has both advantages but also disadvantages such as becoming lost or needing good manual dexterity to change or alter controls. The placement directly into the ear canal also creates some issues with wax buildup and the device must be cleaned and maintained on a fairly regular basis. Still the opportunity to have a low-key hearing aid that enables regular use of the telephone and doesn't pick up wind-resistance like other models is enough of a benefit for most users. The unit is recommended for people with mild to moderate hearing loss but also those with a long enough ear canal to hold the device. Still, CIC devices are the most popular custom hearing aids with a reasonable bottom line price of $200-$300. Another popular customized hearing aid is one that fits in the ear (ITE). These units are molded exactly to a person's inner ear and fill up the ear when placed inside. The devices come in a number of different skin tones to help minimize the visibility and can rarely be noticed when looking at a person face to face. That being said when looking at a profile view of the aid wearer the device is fairly noticeable. The units are typically recommended for individuals experiencing moderate to severe hearing loss. Typically a child wouldn't wear an ITE hearing aid because the constant growth of their bodies would alter the fit of the mold. One of the key components of ITE devices is that they can be fashioned with an FM transmitter. The user will in turn wear an FM receiver as a bracelet or around their neck and the device will collect the audio and send it to the ear piece. Since ITE hearing aids are custom made for each user, they're typically more expensive than behind the ear devices. A quality model will often retail starting around $400-$600. Following the same design as the in the ear devices are in the canal units, only with less visibility. Instead of taking up the entire inner ear, ITC hearing aids are custom molded for only the lower part of the ear canal. A person usually wouldn't be able to see somebody's ITC hearing aid unless looking directly into their ear. The reason that not everybody uses an in the canal device compared to one completely in the ear is because the smaller units aren't prescribed for extensive severe hearing loss, only moderately severe. Another downside is that feedback is more likely because of the closer proximity between the microphone and speaker in the tinier units. Also people with small ears may have a hard time keeping the ITC hearing aids in place. That being said, ITC devices offer the most discreetness for those with moderately severe loss and the starting price of $300 - $400 for a custom device is very reasonable. A style of hearing aids that are very similar to BTE devices are RIC units. These have the same basic concepts of the BTE, with a case that fits behind the ear and a connecting wire to an earmold in the drum. The big difference between a BTE and RIC is the placement of the receiver. In a BTE aid, the receiver is placed in the case that sits behind the ear, which obviously requires a bigger and thus more noticeable piece. In an RIC unit the receiver is moved from the case to the earmold, which enables not only a smaller case behind the ear but also a clearer sound being emanated. The earpiece can even be custom molded to an individual's ear, which enables a more comfortable fit. One of the downsides of the RIC unit is that it's only recommended for people with minor to moderate hearing loss. The person's ear canal must also be wide enough to accept the earmold. The RIC devices usually retail for $500 all the way up to $3,000. One of the main drawbacks of any hearing aid is the occlusion effect, or the feeling of the ears being plugged up. An over the ear unit aims to resolve this with a unique style which leaves the canal as open as possible. The devices feature a small case that sits behind the ear with a clear tube running into the ear canal. Within the canal is a small speaker that is held in place by an acrylic tip. The exact thing that makes over the ear devices popular is also the thing that leads to their downfall. For instance since the ear canal is open, low-frequency sounds escape the eardrum which can lead to feedback and blurred audio coming into the ear. The design is still popular with general hearing aid users with mild to moderate loss and the starting price of as low as $40 over the counter is very attractive. While the completely in canal hearing aids are very discreet, there is another product known as invisible in canal which are unrecognizable in most ears. People who absolutely want to hide the fact that they use a hearing aid find the IIC device their best option. The ear mold is custom fit to a user's exact ear canal dimensions, only much deeper than the other canal devices, making it 100% invisible. Simultaneously less power is needed because of the proximity to the ear drum and those with light to moderate loss experience improved hearing clarity. Perhaps the most famous IIC device is the Lyric hearing aid. Lyric manufactures an IIC device that can be worn 24/7 with very little maintenance. Users can enjoy swimming, showering, sleeping, and working out all without hassle. The deep placement in the ear canal means the device typically won't jostle around or need to be adjusted. Another convenience is that the unit doesn't need to be replaced daily and can be worn for months at a time. Of course this convenience doesn't come without a hefty price. Typically Lyric devices are sold as a yearly subscription that can cost up to $2,000 per ear. This includes replacement of the devices every couple months and users report that the improved quality of life is priceless. In order to understand what type of hearing treatment works best for an individual, it's important to know that there are a various types of hearing loss and multiple causes of each. Some hearing loss has been existent since birth while others occurred from an illness, unfit working conditions or poor attention to ear health. Healthy hearing involves each part of the ear working together along a series of routes. When there is a problem at one of the intervals it's known as conductive hearing loss. 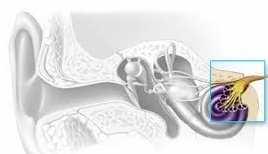 Sound waves pass from the outer ear, through the middle ear (ossicles), to the eardrum (tympanic membrane) and when there's a problem with conduction, sounds may become muffled. This is actually a fairly common type of hearing loss, sometimes caused by earwax, an infection, or pressure changes when flying. Some uncommon causes include new bone growing on old bone in the ear, a tumor, or a foreign object lodged into the eardrum (the first two requiring surgery to improve). Treatment can include anything from the prescription of antibiotics up to surgery. Read more on conductive hearing loss here. While illnesses or ear trauma can cause sudden deafness 4 , the cause of sudden sensorineural hearing loss is relatively unknown. The loss of hearing is unexplained in the patient and usually occurs over a 72-hour period. Because the hearing gradually starts coming back, most sufferers don't even seek medical treatment. Of the patients that do see emergency personnel, only about 15% of the cases can be pinpointed to a specific cause. Because the loss is typically in only one ear, most patients consider it an anomaly instead of an indicator of something serious. Many people with SSHL take a wait and see approach and about 80% of the cases are able to regain full hearing without medical treatment. The remainder of SSHL sufferers will need a steroid injection or even the use of a hearing aid to regain complete health. Read more on sudden sensorineural hearing loss here. Some sorts of high frequency hearing loss start showing up in teenagers and even children. The particular hearing loss consists of standard audio comprehension except on sounds from 1,500 to 6,000 Hertz. Ironically some parts of speech such as the letters s,h, and f are conveyed in high frequencies, which makes them hard to understand when used in speech. This is where many individuals with high frequency loss report hearing a person but not understanding them. Exposure to loud noises is considered the main cause of high frequency hearing loss. The latest reports are especially discerning considering young people, in which the cases of high-frequency loss have increased dramatically. The increased popularity of iPods in teenagers has them inadvertently damaging their long-term hearing health. Other factors that contribute to losing high frequency hearing are heredity, aging, and diseases. Hearing aids and cochlear implants can help improve hearing by taking high frequency sounds and lowering them. Read more about high frequency hearing loss here. Low frequency hearing loss results from damaged inner ear hair cells. Similar to high frequency hearing loss in which people can't hear frequencies above a certain decibel level, low frequency loss is the opposite where individuals can not distinguish sounds below a designated point. People with low frequency hearing loss suffer from the same misunderstood speech and muffled sounds that those with high-frequency loss do. Low frequency hearing loss is hard to distinguish because the symptoms are minimal, meaning the value of low frequency words isn't as meaningful. Typical causes of low frequency loss include a mutation of the Wolfram Syndrome gene 5 occurring at birth, Mondini dysplasia and Meniere's disease. Treatment of low frequency loss includes the use of a hearing aid but with extreme care. Advanced multichannel devices are needed and the risk of overamplification could cause extensive damage from loud sounds.
. There are over 100 causes of sudden deafness including immune diseases, neurological issues, abnormal tissue disease and of course violent trauma. Sudden hearing loss can happen at once or over the course of up to three days. Depending on the severity of the deafness, normal hearing can return in a couple days or over a two week period. Most people can report a full return to healthy hearing while about 15% of people notice their hearing loss will gradually decline. Seeing a physician will give the best treatment option for sudden deafness which often typically includes a steroid injection. One of the most common forms of hearing loss is Presbycusis, as it occurs from natural aging (also called "age related hearing loss"). It is a progressive form of hearing loss, often starting with muffled or faint sounds and evolving into what can become severe loss. It should be noted that harmful external factors over a person's life including working in a loud factory or attending rock concerts aren't associated with Presbycusis, which only factors in normal aging. Presbycusis has said to start early in life, roughly around 18 years old. The first onset is usually the inability to distinguish high frequency sounds. Still, more common symptoms aren't noticeable until later in life. There are a number of things that factor into Presbycusis including heredity, dietary habits, smoking, hypertension, and the ingestion of ototoxic drugs such as aspirin. Presbycusis is not medically or surgically treatable, although hearing aids can help restore some of the lost hearing. Noise induced hearing loss is a direct result from irresponsible ear care. The symptoms can occur immediately such as after a loud concert and can appear for days. Even when sudden noise induced hearing is restored, there will likely be long term effects that result from the exposure. High intensity sound, especially over a long period of time, will cause damage to every part of the ear, inner, middle, and outer. What frustrates health care professionals is that noise induced hearing loss is nearly 100% preventable. Ear plugs and other safety devices can be worn in the work place and radios can simply be turned down to below 85 decibels with no permanent damage. Most treatments of NIHL, with the exception of The Hearing Loss Pill, are geared to coping with the loss instead of reversing the effects. Hearing aids and cochlear implants are the most widely used ways to regain some semblance of previous hearing but they are only focusing on making the noise louder instead of actually trying to treat the cause. The problem of central hearing loss is directly correlated to the central nervous system. The root cause isn't necessarily the ears, but the brain's ability to interpret the words and sounds it's hearing. While central hearing loss is continually being examined, it remains somewhat of a mystery. Central hearing loss could be explained as a sort of learning disability, as people lose the ability to filter competing sounds. For instance a person with healthy hearing will be able to 'zone in' to a television in a noisy room while someone with central hearing problems will hear all sounds at the same time. Testing for central hearing impairments is difficult because the ear canal and drum seem perfectly healthy. Also if an individual shows some signs of other various hearing loss, it may actually mask the correct diagnosis of central hearing impairment. Currently the best treatment for central hearing issues is education. Once a person is aware that they suffer from inconsistencies in their central nervous system, they can help create an environment that is beneficial and less chaotic. There may be a small dedicated TV room or children may need a quiet and relaxed study area to maintain their grades. We can add that The Hearing Loss Pill can be a GREAT central hearing loss treatment due to the nerve enhancing properties found in it. The Hearing Loss Pill works to optimize the nerves of the ear AND the brain to help the body understand what the sounds are. Extensive damage to multiple parts of the ear is known as mixed hearing loss. The impairment is known as a combination of conductive and sensorineural hearing loss. This indicates that there is damage to both the inner ear and outer ear, outer ear and middle ear, or middle ear and inner ear. The common symptoms are sounds that appear faint and muffled and conversations are difficult to understand. Causes of mixed hearing loss can number far and wide. Genetics, a consistent exposure to loud sounds, normal aging, disease, drug use 7 , birth defects and more all lead to issues that affect different parts of the ear. Since there are so many factors that contribute to mixed hearing loss, the treatments also vary on a per-case basis as well. Certain medications can alleviate the problems while a more severe diagnosis might call for a corrective surgery. Mixed hearing loss is also one of the perfect candidates for experimental techniques and research such as a bone conduction implant, and for the standard use of The Hearing Loss Pill. Hearing is something that a person is either blessed with at birth, gradually lost, or never had. Not many people realize the importance of protecting all parts of the ear on a daily basis. Whether it be diseases or the loud sounds of daily living, good hearing is constantly being threatened. Luckily, there are a few methods that individuals can take to both protect their gift of hearing and get it back when it starts to fail. Q: Is the Hearing Loss Pill a cure for hearing loss? A: No, our product (The Hearing Loss Pill) is NOT a cure, it is an ongoing treatment to slowly improve the nerves in the ear and help the brain to better respond to sound. This will improve hearing over time, but it is not a cure. Q: What treatment options can cure hearing loss? A: The closest thing available to a cure for hearing loss would be a stem cell hearing loss treatment. With this treatment stem cells are implanted with hopes of them regrowing the defunct nerves. There are some reliable reports of this working and being available in specialty clinics in Asia. Unfortunately though it will cost over $30,000 (cash only), and is still considered in the somewhat experimental stage. The FDA has approved a study for stem cell usage however. The study is currently showing very good results. The only downside is that the approval time for new treatments such as this can take up to a decade or more. Stem cells for hearing loss treatments are still very new. 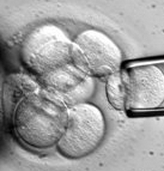 Some countries such as China, Korea, South Africa and Israel offer stem cell clinics 1 . There have been recent reports of a growing amount of those from the United States, Australia, Canada and the UK visiting the clinics in these locations to get the treatment.